Crafty Garden Mom: Sew Mama Sew Giveaway Day!! Those of you who already read my blog know I LOVE to give stuff away..mainly because I love anything crafty that's FREE! I'm participating for the first time in the Sew Mama Sew Giveaway Day and couldn't be more excited. I have my fingers all set to win something from at least one of the MANY other blogger's generously giving stuff away too. After all TODAY is my 8th wedding anniversary where I was lucky enough to marry the Most Wonderful Man in the World. He puts up with me, my big mouth, and all my crafty crapola, so that alone has earned him the title. But enough about him, I'm just hoping that luck will rub off on some free stuff for ME! I decided my giveaway item would be something wonderful from my stash I think is just adorable, but I know I'm just not going to use any time soon seeing as my WIP and UFO pile are crazy-packed right now. 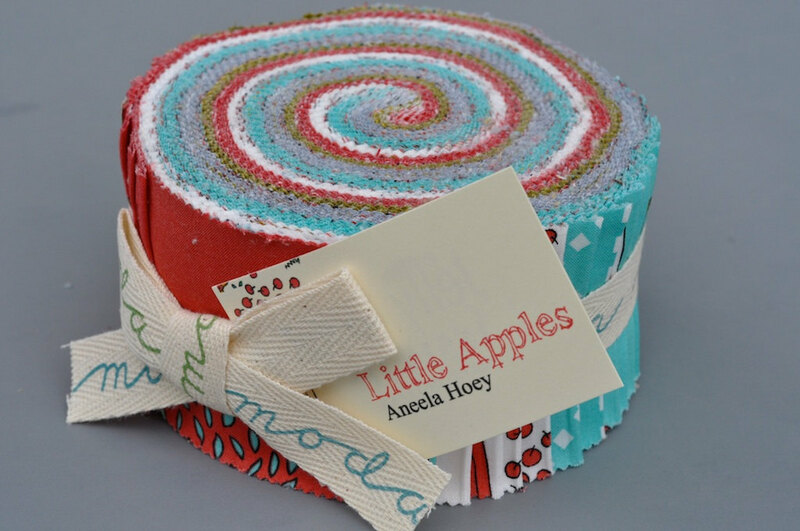 Yes, it's a brand new jelly roll of Moda Little Apples by Aneela Hoey!! From the Lilabelle Lane blog, check her out! From the Sew While He Sleeps blog, check her out too! From the Quilted Works blog, check them out! Wait, those are some really cute quilts, maybe I should reconsider this....QUICK! Leave a comment below telling me what you'd make with this Little Apples jelly roll before I change my mind about sharing my stash! +Earn a bonus entry when you follow my blog and leave a separate comment saying you are. Giveaway ends May 25th at 5 pm PST/8 pm EST. I will ship internationally. For all the details on Giveaway Day, please visit the Sew Mama Sew blog here. I love this line of fabric! Well I do love quilts so I think I would be making a quilt with it. I love Moda Fabrics...this line is on my wish list to make a cute quilt for our living room. It's adorable. I am in love with everything she's done and I own two jelly roll quilt books that I have only made two quilts from so far! It would have to be a quilt of course, the quilt from Quilted Works is really nice. I'm going to a family reunion in Maine this summer and thought I'd make quillows for all the kids (8!). If I won this fabric, it would become a quillow. Thanks! The quilts are really cute and jelly roll are so versatile ! Thanks for the chance ! Oh my, Little Apples is on my list of fabrics that I would desperately like to get my hands on! A very lovely woman at work is expecting her first very very long awaited baby, and I would turn that jelly roll into a baby quilt for her. A modern quilt for sure. :) Great giveaway. I really want this! I would make drawstring bags and maybe a little quilt. I follow your blog and your podcast! Does that get me two entries? ;) Thanks for the giveaway. That third quilt is really adorable, but I think something by Jaybird Quilts is calling my name right now. Gosh, I love that Quilted Works quilt. I think I would try and make something like that. Thanks for the giveaway. i love Little Apples! i would make a baby quilt :) thanks for the chance to win! I'd make a quilt for our quilt ministry! How adorable...that last quilt is beautiful. Thanks for being willing to share. I would make a zig zag type quilt with it! Thanks for the giveaway! I would make a quilted bag just for me! I would love to make a pinwheel quilt with it! Ooooh....it'd be so hard to decide. I like the quilt you showed with the trees, or it'd be great for a set of baby quilts. I'd make a jelly roll quilt! I love pre-cuts! So generous of you to raid your stash-thanks! I'm into granny square quilts lately...so that you probably be the one. I would make... some placemats and fun scrappy kitchen items with this jelly roll - love the bright fun colors! Oh, matching pillows. Because... because! I have two layer cakes of this that are being stretched to the max to make matching twin sized quilts for my little one's bunk beds, and he needs matching pillows but my layer cakes are eaten up completely by the quilts! I would love to make a quilt. Happy Anniversary! Thanks for the giveaway! I'd make a toddler size quilt. Maybe a zig zag quilt, or Camille's Hopscotch? Love your podcast... I have a couple of baby girl quilts I need to make. There's this awesome nine-patch tutorial on Moda Bake Shop's site that I've made before. This would be perfect! Thanks for the giveaway, and happy anniversary. Hope you win something! HAPPY ANNIVERSARY! and I'd make a quilt for our CASA quilt project - this is where we make quilts for children in foster care. I would love to make a quilt for my daughter. I think she'd love this line! I'd make a cot quilt for me soon to arrive niece or nephew. What a fabulous prize!! I adore the colors! I change my mind about 100x in the design process, so I can't say what I'd really make with it... but at the moment I am thinking of sewing random rectangular sizes together into stripes, along with some matching solids, and then sewing those together! I have just the block to use with a jelly roll! a pattern called boxy stars that I have done before with French General jelly rolls! I'd be tempted to copy your inspiration blogger and make the "apple crate" quilt - I love the appliquéd trees! I am following with RSS. a quilt for my kids! A quilt would be beautiful! Or maybe a pretty table runner! I would make either the Apple Crate quilt from Moda Bake shop (similar to the bottom quilt in your post) or a 1600 quilt that I've been wanting to try! I would make a new quilt for my daughter with this! I would probably make a simple quilt like the first picture you posted. I am new to quilting so I need an easy pattern! My good friend is having her first baby this year and im sure she would love this print. really cute fabric! I really like the quilt pattern from Quilted Works! Thanks for the giveaway! I've been wanting to experiment with log cabin blocks--this would be perfect! I'd make a strip rag quilt! I'd make a quilt, of course! I really like the look of that last one from Quilted Works. I think I'd make one like the one from Quilted Works- so clean and modern. Thanks for the giveaway! Love Little Apples! I would make a fun picnic blanket with this :) Thanks for the chance to win! There's a quilt pattern on Moda Bakeshop (the name currently eludes me) that I've been wanting to make. This jelly roll would be perfect. Now to go track it down . . . I have a couple charm packs of little apples, this would be perfect to make a quilt for my living room! My grey walls let my accessories...ahem...quilts show off! I would definitely make a quilt if I were to win. thanks for a chance. Lovely jelly roll - I think I would use it for one of the quilts I have earmarked for my soon to be here nephew or maybe for his big sister. Thank you. I also follow your blog and wonderful podcast. Thanks again. Lovely giveaway. I recently learned about Jelly Roll races, and would do one those with this awesomeness. A quilt! I love this line, don't change your mind! I really like the look of the string quilt. My sister is pregnant and if she has a little girl, this would make a beautiful baby quilt. I love baby quilts and I'll bet that a jelly roll plus a few pieces from my stash could make TWO baby quilts. One for a gift, one to donate. That would be fun! Thanks for the chance. Those fabrics are gorgeous, I think I'd use them to make a table topper and matching place mats. Such a darling line of fabric and I don't have any yet! I'd love to make a quilt for my girls with it. Thank you for the generous giveaway! I hope you win something too! The lattice string quilt is super cute! I checked out her blog--love the way she used a bunch of "won" materials to make such a beautiful quilt! cushions, cushions, and more cushions!! I would love to make a little baby quilt for my new little girl who is due in October! I'm loving the red and turqouise!! I am a blog follower now too! I'd want to make a quilt as seen in that 1st pic you have shown! Great giveaway! I never got any of this line, and its so cute! 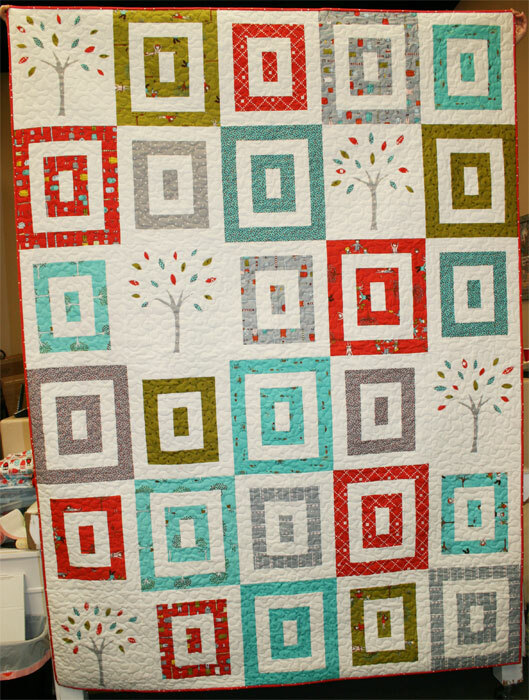 I think I'd make a Summer In The Park quilt (tute from Missouri Star Quilt Co). Thanks so much for the giveaway! I am really loving the quilted works quilt you've shown. Love that bottom quilt. Maybe getting this prize would be motivation to make it! I would love to make the bottom quilt with the jelly roll! I'd make a quilt for Project Linus. Something simple but cheerful! I am a new follower. I found you on the Bloggers' Quilt Festival. I would make a quilt for my sofa. I have been eyeing this fabric but yet to get it because I have other projects I need to get done first. Thank you for sharing your stash. i need to make some baby quilts!! i have so many friends (and friends of friends) who don't sew but would totally rock out a baby quilt with their little cuties. I'd make a baby quilt, of course...love that one from Quilted Works! a play mat-quilt for my baby girl. i've never actually used a jelly roll before! I'm slowly making quilts for the grandchildren I hope to have one day and this jelly roll would certainly make up into a lovely addition! My next quilt is for my boy. In Aneela Hoey Sherbet Pips, so this would add a little nice touch to it! I would try a proper quilt, so far I've always cheated a little! I would search patterns for hours and then decide to make a baby quilt! Am now a follower as well! I love this line, it is so fun and would make a wonderful quilt. Having the precut, would make it easy and quick to make up for the summer. I would love to make a quilt foe our gardenhouse. We have lots of apples there!Lol! I'd make that 3rd quilt with the trees on it. Love that one! I am a new follower now! I would play around with some different quilt squares! A jelly roll race quilt! I want to make a cute picnic quilt so we can enjoy it all the time, I love Aneela! I would love to make anything out of cute jelly roll...I could write something here but would change my mind a dozen times before doing it. hmmm.....I have a pattern I've tucked away for a while from Create HOPE Designs that uses a jelly roll, so maybe I'd finally do that! Thanks for the chance! I've never had a jelly roll so I'd have fun making a quilt! Maybe a log cabin quilt. I love the Little Apples line and have used it before. Thanks for the giveaway. I'd definitely make a cute quilt - not sure what pattern though. Oh, I love this and would make either a quilt or a bag to show off! Thanks for the great giveaway! Never tried making anything with a jelly roll before. Guess I'd make some placemats and/or a table runner. I love this line, I think it would have to be a quilt! Oooo a quilt!!!! I love this fabric, especially since I have met her in person - she's AMAZING! Fab giveaway! I haven't a clue! But hopefully after stroking it I'd think of something! I think I would make Sew While He Sleeps with this fabric...It is gorgeous!! That gift is way too lovely not to be a new follower..thank you for the chance. I saw a tutorial for a "jelly roll pouf" a few weeks ago and would love to give that a try! So fun! I'd make "Small Plates" from Elizabeth Hartman's book. Those are some really cute quilts. This is a really cute line of fabric! I love the modern squares and trees. I think that's what I'd make with the jelly roll. This would be my first jelly roll, so I'd probably just do a simple strip quilt! Allison's (cluckclucksew) off-track pattern would look super cute with that jellyroll!!! Thanks for the giveaway! I would made a quilt for my little girl that gasps every time she sees this fabric. A quilt-I love that one you show by Quilted Works. I think I'd split it up. Some for a boys quilt for some dear friends and their first baby. And some of those whites, reds and greys for baby clothes for my niece. I'll follow your blog and a happy anniversary to you! This would be really cute for a Summer in the Park quilt. Thank you for the giveaway! This is my FAVORITE line right now!! Such an awesome giveaway! I'd have to make a quilt. I really like the first one you posted. And I'm now following your awesome little blog! Can't wait to see more! I would be making a cot quilt using the Enigma Square block. Love the colours and the fresh look of it. I will make a lap quilt with it. Love the colors... They will work perfect in my new craft room. Hmmmmm, what to make? Something that will make you smile... Maybe a log cabin of sorts with an embroidery center. i need to start a quilt for my best friends first baby on the way :) this would be perfect! Thank you for the chance. The colors are perfect for a cathedral windows project. wow-generous! i'd make that quilt from the quilted works! I would love to make a baby quilt out of this. It's so cute. Maybe some fabric covered beads for a necklace! I'd make a Granny Square quilt especially for me! It's about time I make myself a quilt. Thanks for a chance to win. I have a jelly roll of Shebert Pips and I really want to make a reversable quilt with that and little apples so that is what I would work on. I love this fabric line. I would like to make the Apple Crate quilt from Moda Bake Shop. Thank you. I would make a strip twist quilt! I would definitely use this in a quilt. What a generous giveaway! This is one of my favorite prints! I would make a quilt and keep it for myself! I love that last quilt you showed. I would make a quilt something like that. May even have to go buy a roll if I don't win. An apron! I love jell roll aprons! i just finished a quilt for a fundraiser for my daughers ballet troup...i used sherbet pips jelly roll and it turned out great...im thinking another one in little apples would be great for my own little ballerina!! thanks for a chance...oy! Thank you for a chance to win such an awesoem giveaway! I would have to make a nice, cozt quilt for my living room. The fabric is so bright and beautiful I would want it in a room where everyone would see it. Angain thank you a chnce to win. I have been wanting to try out making a jelly roll into ruffles to put on a skirt or dress for my daughter. Happy Anniversary! I love that you included so many great images of quilts made with this line. :) I love the string quilt especially! Thanks for the chance. I love this fabric! I would make a bag to carry all my stuff to school. I love how you've posted some ideas for this jelly roll! I've never made anything with a jelly roll before, so it would be a new experience for me. I'm not sure if I'd go after a quilt or try to make a nice set of placemats or tote bags to give away to friends. There is a quilt that my great grandmother made that would be adorable made from little apples, so that is what I would make. Thanks so much for sharing with us. I want to say quilt just because the ones you showed are beautiful but I have yet to be brave enough to embark on such task so I would probably make a twirly skirt and matching applique shirt for my dd and who know I might even start on some of my Christmas sewing!! I'd make a baby quilt for my newest great-nephew - the colors would be perfect. Thanks for the great giveaway. I think I'd make a patchwork tote with some floral embellishments for the bag and my hair! Oh it would be a quilt... now which one I am not sure there are too many good jelly roll patterns out there. I love this fabric but have none. I would definitely use it to make a quilt. It would be so stinking cute!! At the present, I am making small quilts so that is the direction I would aim for with this jelly roll. I have some sherbet pips I have been hoarding and not cutting into . I would put them together for an awesome kiddie quilt for my DD!